This week Kate and I took a quick overnight trip starting at Round lake, and looping through Gabimichigami. We had great weather, and shockingly, saw very few people. Our route had us portage into W.Round lake, and head towards Brandt lake from Brandt we portaged to Flying, and then Fay lake. Water is very high in this area, and the portage to Fay involved long stretches of knee to waist deep water. I had been over that portage in June, and it was much drier. I suspect there is a beaver to blame somewhere. From Fay it was on to the Chub river and Warclub lake. I was eager for this section, since neither of us had paddled the area between the Chub River and Peter lake. We ate lunch on Warclub, and had our fill of blueberries. Next was Seahorse lake, one of my favorite lakes of the trip, with high rocks and sprawling bays. Once we portaged into French lake, and then Peter, we were done with the small lake portion of the trip. Like all of the lakes so far, Peter was burned, and didn’t look like it offered great camping. From Peter we portaged to Gabi, our destination for the day. Gabi is a large expanse of water, and with the exception of the south bay, unbroken by islands or peninsulas. We found a nice campsite and made our home for the night. We swam and looked for berries, before eating dinner and going to bed. The next morning it was a treat to have fresh blueberries in our granola! We were on the water by 8:30, and made our way through Rattle lake to Little Sag. 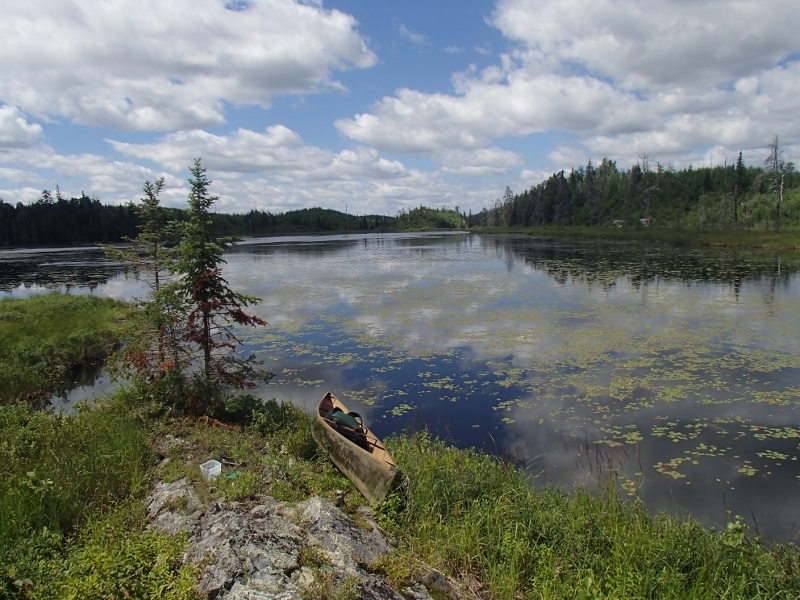 Little Sag is a pleasure to paddle, and we wove between its islands as we made our way towards Mora lake. We’ve always enjoyed the portage to Mora, with its great views of the last drop of the Frost River. From Mora we paddled Tarry, Crooked and Owl lakes. On Crooked we watched a Loon feeding its young. We portaged to Tuscarora lake, and paddled to an island to swim and eat lunch. The day had become very warm, and it was nice to find some refuge in the shade. We finished lunch, and made our way to the long portage out of Tusc. Despite my love of the Howl Swamp portage, we choose the more direct route to Missing Link lake. The portage was long and hot. There was an abundance of frogs on the Missing Link side, many still with tales. We paddled Missing Link and returned to Round Lake. On the drive home we bemoaned the lack of a functioning air conditioner in my truck. It felt so great to get out over night in the middle of the season. We were very lucky in regards to the weather and the solitude.